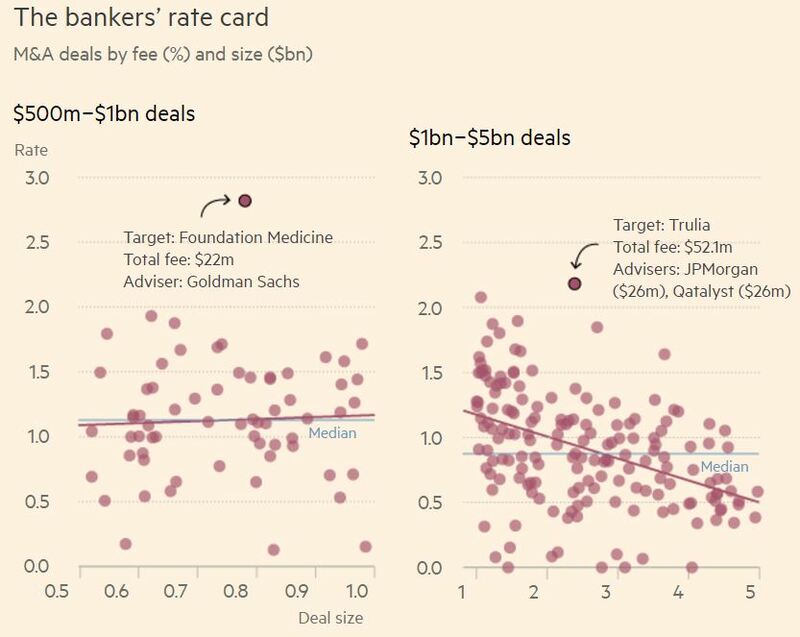 The Financial Times has published an excellent article about M&A fees which includes some great charts of deal-by-deal fee rates. What leaps out from the scatter plots is the vast range between high and low fees even for similar-sized deals. It proves that there is vast scope for negotiating M&A fees, with millions or tens of millions to be bargained over. How can you negotiate higher fees for investment banking advice? deploying a closing manoeuvre rather than just cutting your fee and hoping they say “yes”. And partly by being smarter about the fee structures you use. The article mentions several structures, including ‘discretionary’ fees and ‘ratchets’. The difference between a very low and very high fee often depends on whether a bank gets paid the discretionary fee it hoped, or achieves a deal at which the ‘ratchet’ pays out. When we train bankers to negotiate M&A fees we help them avoid the pitfalls of each structure. A bank takes three risks when offering a discretionary fee instead of a contractual one. and the client might decide not to pay it, or much of it, anyway. Bankers agreeing discretionary fees: are you thinking clearly about these risks? Why is the client asking for discretionary fees? What smart questions can you ask, and what structures can you use, to mitigate the risks of going unpaid, and to maximise your chances of a big payday? Most bankers fall into the ‘estate agent’ trap. Which is ironic, given that estate agents might be the only profession lower in the public’s esteem than banking! You pitch to sell a flat / company which you think is likely to sell for €1 million / billion. You feel you need to tell the seller that you can sell their flat / company for a very punchy €1.2 million / billion, because you think that will get you selected as agent / banker. But then you raise the topic of a ratchet, above which you’ll get paid big bucks, and the client says “you said you could sell it for €1.2 – so the ratchet needs to pay out only above €1.2”. Trapped! Here is a (rare) piece of free advice. Don’t behave like a shiny-suited estate agent when you’re trying to portray yourself as an urbane master of finance. We help bankers play the many angles of ratchet negotiations. How can we get a feel for the seller’s true opinion on what their company is worth? What if the seller has unrealistic expectations? What if the markets turn down during the deal process? What if the company’s EBITDA is actually lower than they told us before we set the trigger level? What if the client does not take its highest bid, because it cares about non-price items? Hartley-Brewer Negotiation Consultants are the acknowledged experts in investment banking negotiation, including fees. With our help, your fee negotiations with your clients will demonstrate the creativity, collaboration, intelligence and firmness that you will deploy when negotiating for them. Note on the charts: the Financial Times’ data, from Dealogic, are for sellside M&A advice to US public companies, 2014-2016. The FT does not clearly state whether these deals all completed: non-completion might account for the ‘zero’ fees in the charts.